Toddler sleep issues, baby beds, and how to get kids to sleep. Toddler sleep issues can be disruptive, check out some real life help. First of all I'd like to say that toddler sleep issues can be as disruptive as the baby that will not sleep. So this page is dedicated to helping you be successful getting those older children to sleep. No child is forced to sleep at my house -I don't know how you can "force" sleep anyway?! However, they are encouraged to rest- even if they are older (like 5 or 6 years old). As with infants, it is important for their health and development. - Where they sleep- same place every day. At my home they sleep in my family room, which is also what I consider my "daycare room". Click here for my page on the Sleeping Area. Prior to lunch time everything has to be picked up and put away, then the kids get their "baby beds" ready. - They nap in the same spot every day. They are all at least 4-5 feet away from each other- any closer together than that, they'll mess around with each other and not rest or go to sleep. Eliminate the toddler sleep issue with a little space. - "When" they sleep, the same time frame. Toddlers- one or 2 naps a day? Our nap time is from 12:45 till 3:00 P.M. In my child care policies I ask parents to avoid picking up their kids during this time frame, or even calling me... it never fails, you'll get them all asleep and the phone will ring and wake them up. - What they sleep on or in*. 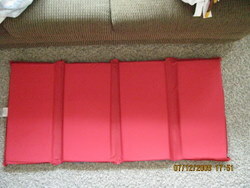 My 2 year olds and on up children sleep on "The Childrens Factory" mats on my carpeted floor. These are great because they are 2 1/2 inches thick, very durable, as well as easy to clean daily or when a child has an accident. You can just spray them with "Clorox Anywhere" and wipe them off. Each of them has their own blankets and pillows (all are different for easily identifying). I made their blankets out of large comforters that I cut down to child size, and hemmed. 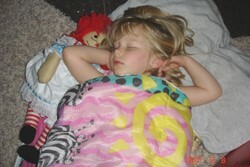 Some do bring their own security blankets and stuffed animals, anything that helps with the toddler sleep issues. They still get a blanket that Julie made for them too, surprising how that sometimes even makes a difference. - The toddlers (and infants) sleep in small baby beds or cribs that my local Child Care Resource and Referral supplied for me. 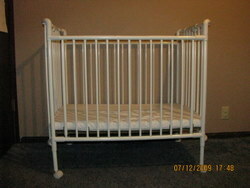 These are nice and sturdy little baby beds, however they don't store as easily as a pack and play would. But they don't recommend we use them. - What they sleep with ... Blanket, pillow, stuffed/security toy. As I mentioned, the kids have their own mats, pillows and blankets. Some kids will bring their own security blanket or stuffed toy. (That's ok with me as long as they are clean and it helps with toddler sleep issues). I have some little ones that sleep with stuffed teddy bears that are mine. (same one, every day). They are allowed to have them as long as they don't end up throwing them at the other kids or chewing on them (choking). Keep in mind, these are the older toddlers(2,3,4, and 5 year olds). Never put stuffed animals or blankets on infants. - Type of music listened to. As with infants, you want some kind of music on for soothing "noise" so other unexpected sounds won't wake them up (like the phone!) I use a local Christian radio station- no loud music or blaring commercials. If you have some classical or soft instrumental CDS, they will work well, too. I personally like some variety and I get that from the radio. - Who they are next to Some kids really love to goof around at naptime. You will get a pretty good idea from play time which kids will be able to nap close to one another. I do not read to the kids right before naps- for a couple of reasons. I like to read with a lot of expression- I use different voices, LOUD and soft and sometimes this will really rile the kids up! Don't want to do that right before I expect them to be able to rest!! The other reason is I know a lot of the parents like to read them bed time stories. I like to keep that a special time with their moms and dads. I have my own nap time ritual. Of course everyone needs to go potty before they lay down, a major toddler sleep issue. Once everyone is in their baby bed or on their mat, then I "snuggle-buggle" them all in. (just a fun word for tucking them in with a hug). Then, since they are lying very still, I will touch them on the forehead with the "magic sleeping star" which is just a wand with a star on the end. It works wonders for helping get the children sleeping. You probably have lots of your own fun ideas for your own naptime ritual. You will also develop your own tricks for toddler sleep issues. Remember, Kids like routines- it helps them know what is expected of them, so stay consistent and you'll have great little nappers!